Well, it’s the middle of January and it’s cold outside! Since we live in the northeast it’s certainly not a good time to bbq but it is the perfect time for the hearty slow cooked meal. There’s nothing better than meat that has been braising in wine slowly in the oven for hours where flavours intensify over time. The best part about braising meat is that it all goes in one pot and all comes out of one pot; the meat, the sauce and the veggies. It’s almost effortless. Once it’s all in the pot you just let the ingredients do their magic and you sit back and take all the credit for spectacular flavouring and taste! There’s only one caveat to this slow cooked braising and that is the special pot that is required. The best pot for braising is what is called a Dutch oven, an enameled cast iron pot. If you don’t have a Dutch oven you can also braise meat in an electric slow cooker. However an investment in a Dutch oven is well worth it, as it can be used for a multitude of other recipes. These are great pots as they can go from stove-top to the oven. They are particularly best for braising as these pots hold the heat well and their heavy lids keep all the flavours securily in the pot while it slowly simmers. I must say that the Dutch oven is probably one of the best investment you’ll make in your kitchen as it will last a lifetime, my mother bought hers when we lived in France, which was way back in the early 70’s. She’s had it for 40 years and it’s still in use! 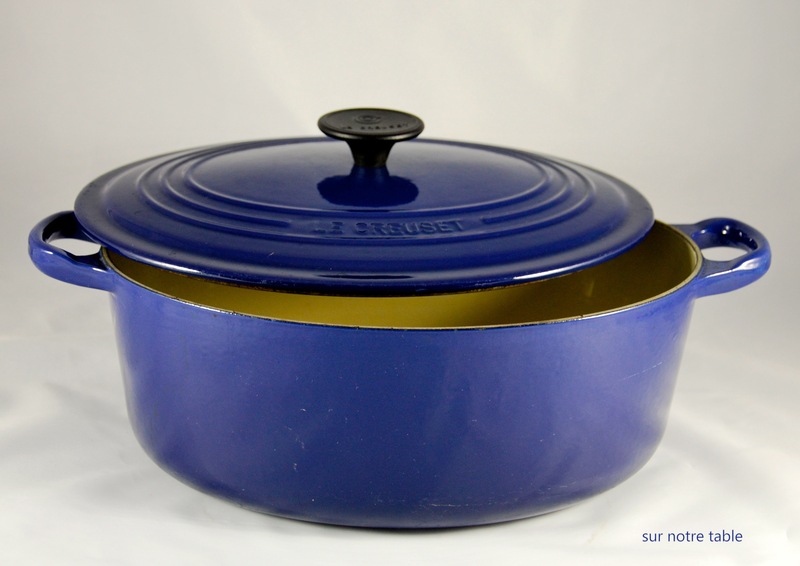 The most recognized brand of Dutch ovens are by Le Creuset, which has pretty much made an entire business of just selling these in a rainbow of bright colours. The beauty of these pots is that they clean up very easily. They are expensive, but if you are a bargain shopper like I am and you live in Canada, you can often find various brands at Homesense/Winner’s at a reduced price. One last comment about buying a Dutch oven, keep in mind that size really does make a difference here. In this case, “the bigger, the better” really holds true. Especially when it comes to slow cooked braised meats, the leftovers are even better as the flavours have intensified over time. So you’ll want a pot big enough to allow for leftovers. The recommended size for 4 to 6 servings is one that holds 5 to 6 quarts at a minimum, whether round or oval. So back to the hearty slow cooked meal! Now there are many braised meats which can be prepared in advance and reheated, such as beef short ribs, beef cheeks, lamb shanks, veal shanks and even chicken. 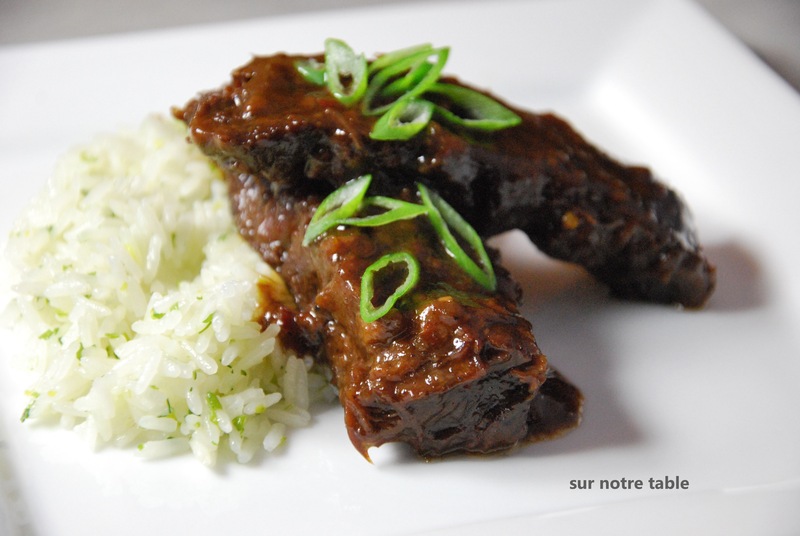 Which I will all share with you in due time, but for this week, we’ll start with the beef short ribs. There’s a multitude of recipes for braising beef short ribs and all are very similar, where the meat is braised in wine and beef stock along with carrots, tomatoes and onions. That’s pretty much the base for braising. We’ve tried many but this one, adapted from a Williams & Sonoma recipe is by far our favourite. This is actually a great recipe for a dinner party as you can prepare and cook it a day in advance. And all you need to do is just reheat it for 30 minutes over the stove top before serving! The bone in beef short rib cut is not often found in the grocery store and it is therefore recommended that you go to a butcher who will know exactly how to cut them. Here in Montreal some butchers call it the Miami cut. 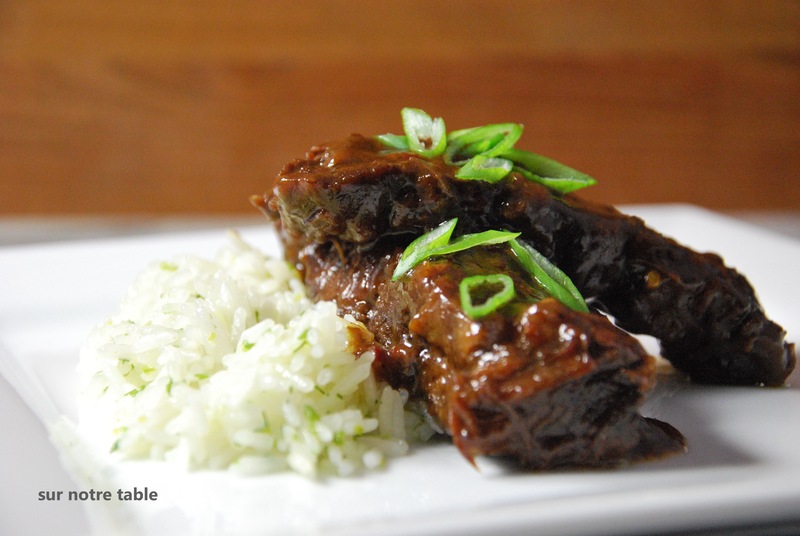 The short ribs are short in length but they have much more meat attached to the bone compared to the longer back ribs. The only way to cook them is to braise them or else the meat is too tough. Butchers may sell this meat boneless but it will lack the flavour that comes from cooking with the bones. Dry beef short ribs with paper towel. Combine in a small bowl salt, pepper, paprika and 1 tablespoon of fresh thyme leaves. Rub the combined spices all over each piece of beef short rib. 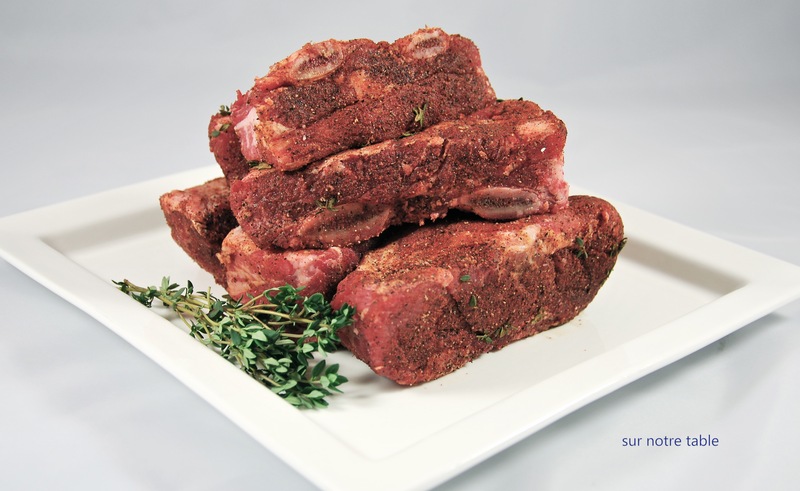 Place short ribs in a casserole dish or large bowl and cover with plastic wrap. Let the ribs stand for 2 hours, if more than 2 hours refrigerate. Add the carrots and onions to the remaining fat in the Dutch oven and cook while stirring often until the onions have softened, for about 5 minutes. Then add the garlic and heat for 1 minute. Add the tablespoon of flour on the vegetables and continue to cook for another minute, until flour is lightly browned. Pour in wine and scrape up the browned bits from the bottom of the pot. Add in beef stock, tomatoes, balsamic vinegar, bay leaves, thyme sprigs and bring to a boil. Once boiling carefully return the ribs to the pot, ensuring most of the ribs are covered with liquid. Cover pot, place in oven and cook for 3 hours. Halfway through cooking uncover and stir ribs around. Cook until meat has fallen off the bone and can be easily torn with a fork. Once cooked, remove from the oven and place on stove top. Remove ribs from pot and place on a plate. Remove from Dutch oven all bones which have fallen off meat and throw away. Discard the thyme sprigs and the bay leaves. Skim off as much fat as possible from the surface. This is even simpler if you completely cool the ribs in the Dutch oven, cover and refrigerate overnight. The next day the fat will have solidified on the top which will make it easy for you to just scrap off the fat before reheating. If not refrigerating, another handy kitchen tool, is the fat separator which is used for separating fat from the gravy, it will easily get rid of most of the fat in the sauce. Once the fat has been removed, return the sauce and veggies to the Dutch oven and reheat to bring to a boil. Reduce sauce for about 20 minutes. Add salt and pepper to your liking and return ribs to the pot. Transfer to warmed plates and serve. 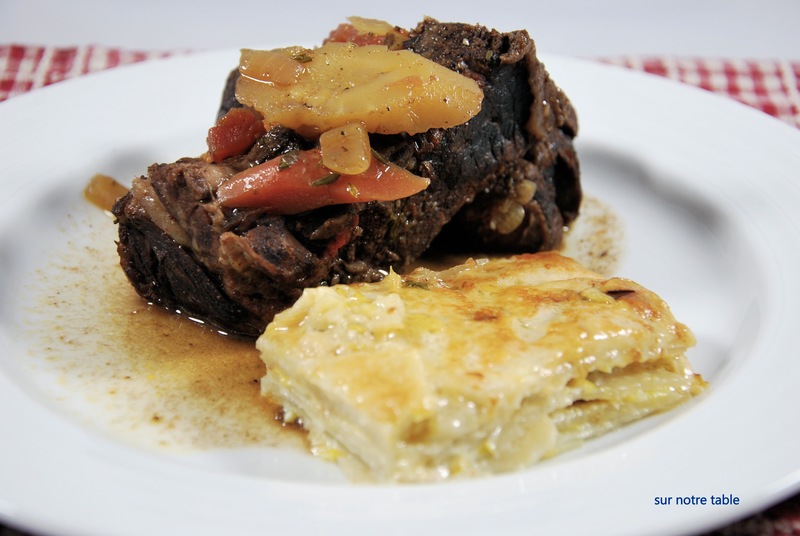 A great accompaniment to the beef short ribs are mashed potatoes or a potato gratin as they will nicely sop up the sauce. Potato celery root gratin recipe to come shortly!